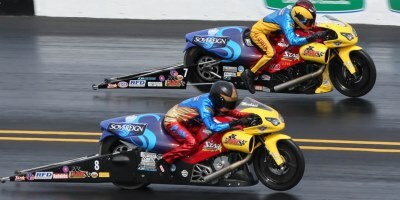 The fourth annual Dollar General NHRA Four-Wide Nationals will present an entirely new challenge for the Sovereign-Star Racing Pro Stock Motorcycle (PSM) team as they adapt to the unique four-lane racing style of zMAX Dragway in Charlotte, N.C. The upcoming Four-Wide Nationals held this weekend, April 19-21, creates a one-of-a-kind racing experience for both spectators and the racers themselves as they compete against not one opponent but three at a time. The Pro Stock Motorcycle class has only raced at the four-wide event one other time in 2010, while Star Racing was on a temporary hiatus from the sport. With the four-wide setup, all four racers must stage their vehicles simultaneously, requiring each to be aware of the other three competitors’ actions on the starting line. Once all four racers are prestaged, the first driver to turn on their stage light begins the seven-second clock for the other three to stage their vehicles before the start sequence begins. “The starting line procedure at ZMAX, from what I’ve read and heard, is a little different. But I’m focusing on just making the best pass I can and executing what we’ve been practicing with riding the bikes really well,” Sovereign-Star Racing driver Michael Ray said. In addition to the different staging lights and procedures, the Four-Wide Nationals event also modifies the structure of the elimination brackets for Sunday, since four competitors run at one time. During the first two rounds of eliminations, the first and second racers to cross the finish line on each run will advance to the next round. The third, final round of eliminations will include the final four competitors from the previous rounds, with the drivers winning first through fourth place in the order they cross the finish line, barring any red light starts. Despite these unique circumstances, the Sovereign-Star Racing team feels prepared for the challenge and has continued to seek improvements in their S&S Cycle-powered Buell engine program since claiming the No. 4 and No. 11 spots in the Mello Yello Series points standings in March at the NHRA Gatornationals in Gainesville, Fla.
“Everything is still new for the teams this season. I think we’ll see most Pro Stock Motorcycle teams run about the same as they did in Gainesville with two or three teams running better, and I plan on us being one of them,” Bryce said. “I’m sure other teams have been working on their stuff and trying to get faster, and I’m excited about where we are at in terms of performance. I think we’ll be competitive and go faster than we did last time. I’m just ready to get back out there,” Pollacheck said. “We’re always improving what we have. We definitely worked on some things from Gainesville that George saw that I could be doing better, and those changes really showed during testing. Besides those few things, I don’t plan on changing anything else about my approach, except for keeping the light green this time,” Ray said. No. 4 Pollacheck and No. 11 Ray will compete this weekend, April 19-21, in the Dollar General NHRA Four-Wide Nationals in Charlotte, N.C. Television coverage of qualifying will air from 5-7 p.m. (ET) on Saturday, April 20 on ESPN2, and eliminations will air from 7-10 p.m. (ET) on Sunday, April 21 on ESPN2.